Claudio Sabini, Enzo Iacchettini (Umbria Mobilità ) Mechanical preparation, internal storage tank. The experimentation was finished with the monitored data on the vehicle in a city route. The road tests were conducted on a path that has led to diversified traits in the plains and great slopes, in order to detect the behavior of the vehicle during the various stress phases of and when fueled in mix of hydrogen at 35% or 100% methane . The dual power supply circuit has allowed us to extend the use of hydrogen in total benefited at a higher rate than those that could be obtained with a fixed supply system. The action of switching between the circuit to mix pure methane and H2, has made possible the use of a torque sufficient to support the loads in the different distances. The dual switching delivery system did not reveal the phenomena of combustion such us misfiring or stop and go during guidance. The hydrogen due to its speed of diffusion and propagation, makes the homogeneous combustion and well distributed throughout the combustion chamber. 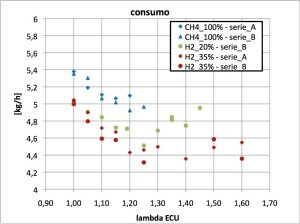 From the overall results, there was an increase in conversion efficiency of about 10%, going from the original 28.2% to 31.4% , maximum obtainable with fuel the hydromethan H2_35% with lambda 1, 60. It is considered important to emphasize that normal functioning of the natural gas engine is to stoichiometric mixture, and that the system of post-treatment of the exhaust gases is performed with trivalent catalytic muffler. The hydrogen, causes a drastic reduction of of the NOx emissions thanks to which it is possible to think of a system of emissions abatement, downstream of the cylinder, constituted by a simple catalytic oxidizer. 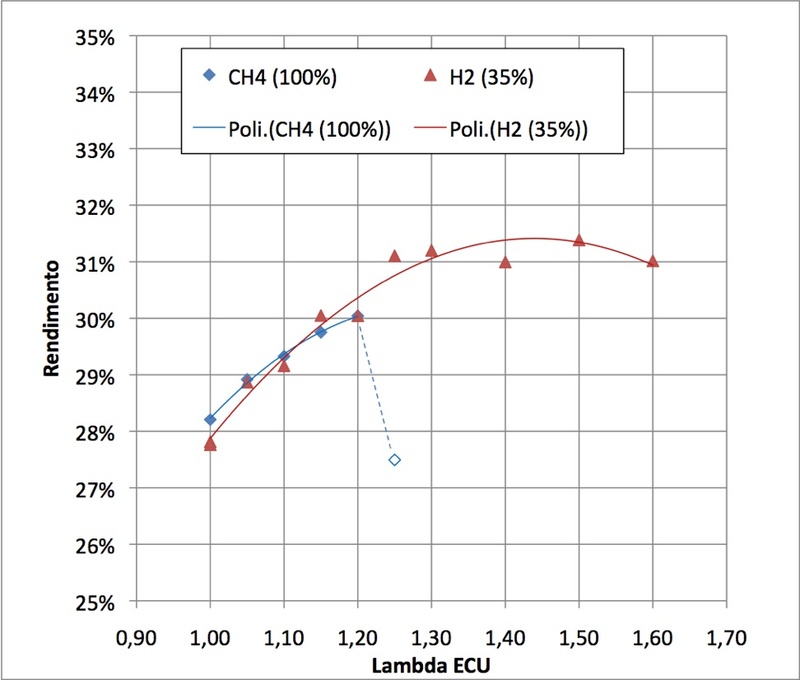 For these reasons, it is widely justified a direct comparison between the results of the operation with H2 – lean than with methane – stoichiometric. 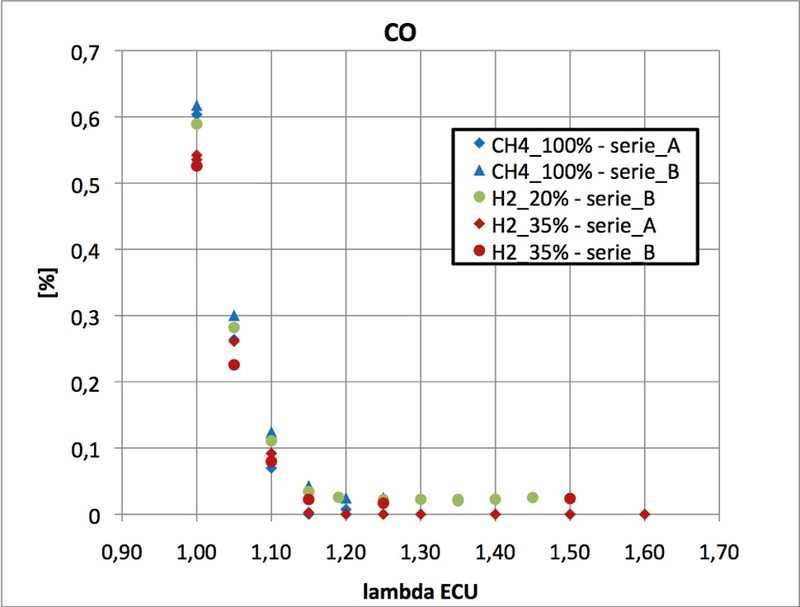 CO emissions recorded during the test are shown in the figure below, refers to raw concentrations. CO emissions can be drastically cut down, bringing them almost close to zero, already out of the cylinder in the engine. The graph shows how the carbon monoxide is reduced nearly completely in case of combustion with H2 to 35%. Similarly, the reasons for the decrease are essentially attributable to the fact that the addition of H2 to methane reduces the H / C ratio of equivalent fuel, in addition to the fact however not negligible that the combustion efficiency is certainly favored by the presence of hydrogen. We show below the result in terms of NOx. 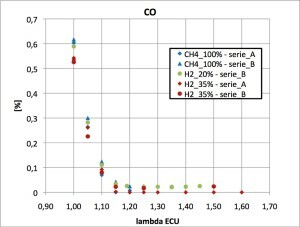 The NOx reduction achieved is extremely important if you are going from 1,500 ppm obtained with stoichiometric methane, to about 80 ppm which have operating the engine in strong leaning, lambda = 1.60. This is clearly attributable drastic abatement of maximum temperatures reached in the combustion chamber. – Is strongly advantageous to operate the engine in a fuel lean advantage of the ability of hydrogen to extend the limit of operation (without misfiring or increase of the fluctuation the torque delivered) until the lambda values ​​approaching 1.70. – In doing so the fuel consumption can drop by 18% and the yield increases by 10%. The NOx emissions are cut down by over one order of magnitude and the CO emission reduced by almost entirely. 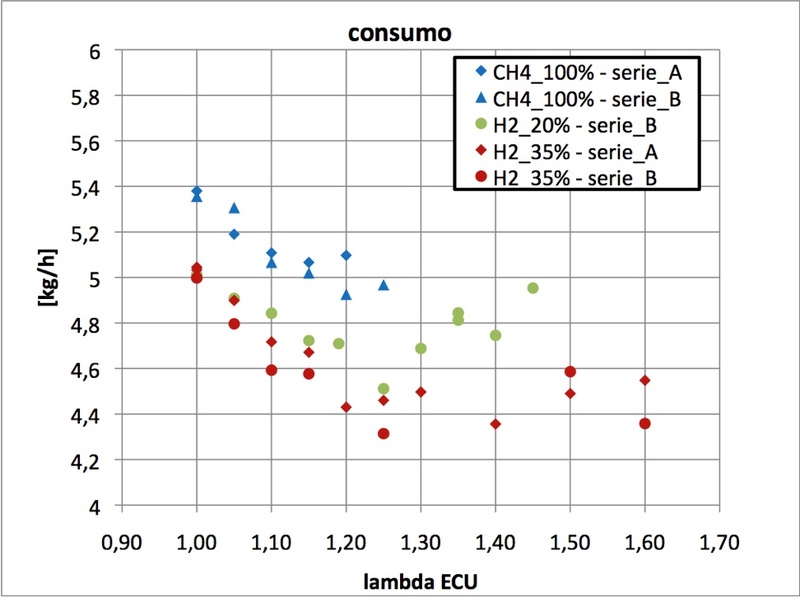 The consumption data recorded during road tests, show fewer fuel delivered when using the 35% H2 mixture. The table shows the percentages reduction of carbon monoxide and carbon dioxide when the vehicle is fueled by a mixture of H2 mix to 35%. The emissions are exceptionally contained in an overall average of 30% reduction on a mixed route and demanding. 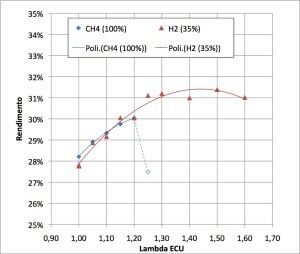 The overall average is obtained as a result of the possibility to use hydrogen in the mixture when the maximum torque required is compatible with flat routes and instead switched to natural gas supply line to full when torque demand is more relevant. 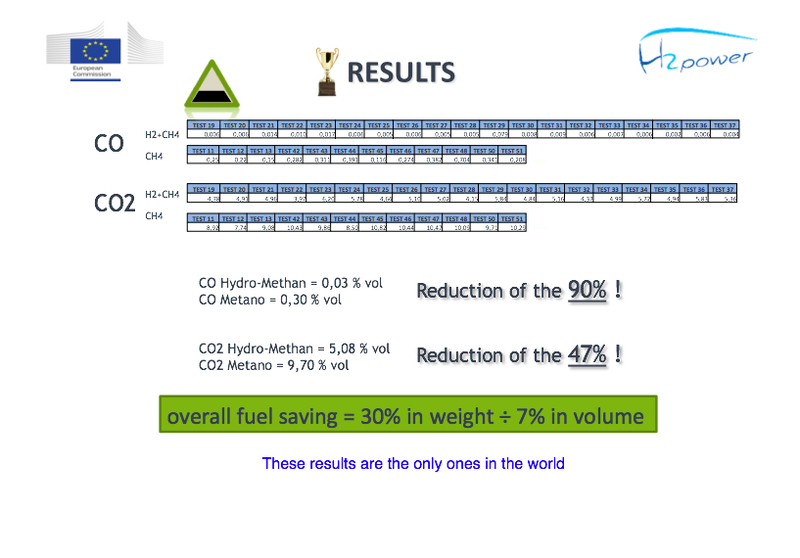 At the end of the experimentation and evaluation of the gas analysis, we can confirm that it has achieved excellent results: The electronic control system with dual power supply with 35% hydrogen, showed a reduction of carbon monoxide between 80 and 90% in the second path (climbs, descents and maximum acceleration) and a reduction of 20% to 40% CO2, compared to fuel to pure methane. Finally, there was a saving in the consumption of approximately 30% by weight, or 7% in volume compared to methane. The implemented system has shown excellent performance, it is still in the testing phase for the industrialization in a retrofit device. The ability to use the maximum mix at 35% on routes that do not require the maximum torque, makes the technology strategy used in the dual system, capable of achieving a reduction of emissions of greenhouse gases around the 50% threshold, because the efficiency of combustion reduces the amount of methane that normally remains unburnt (it’s always greenhouse gas), and thus is to be added to the percentage of CO2 saved. The specificity of the project H2POWER with the dual fueling system has confirmed better performance than system at fixed delivery . This extends the use of hydrogen in vehicles that are no longer capable of supporting the emissions acceptable by European standards. H2POWER’s project is proposed as an interesting indicator for urban public transport companies and companies with fleets and internal means of public utility, the technologies developed can be easily transferred to further European situations to significantly reduce emissions greenhouse gases and toxic pollutants. One of the main elements of the project is to be able to apply the research to the practical case and create the conditions for a real economic fallout , environmental, as well as the reduction of pollutants and saving on fuel consumption. The results confirm the prospects opened up by this research are of great scientific, social and economic. In the last analysis we should remember that hydrogen is a “energy carrier”, for that reason it does not need to be transported and stored in large quantities, but it can be produced where necessary, and if from renewable energy sources, supports a chain of production and use of particularly energy devoid of polluting emissions. The hydrogen, differently to fossil fuels, is non-toxic, non-corrosive and leaks from storage tanks do not cause problems of pollution of soil or groundwater aquifers. Hydrogen is a resource that is ready usable and available commercially and technologically. In particular, makes it great for power distribution infrastructure in “Smart Grid”, with consequent reduction of “carbon footprint” .